The NMEA 0183 / IEC 61162 protocol standard defines specific sentence formats for exchanging data between various nautical instruments. The information transmitted via this protocol may include information such as position, speed, depth, wind direction, etc. As a producer of NMEA 0183 / IEC 61162 compatible hard and/or software you know how hard it can be to set up a reliable and convenient testing environment to evaluate and test your and your competitors products. What you need are tools you can simply install at your desktop PC or laptop generating the NMEA sentences you require, thereby considerably reducing the need for expensive field tests. Our simulation products will absolutely save you a lot of time and money. Sailsoft delivers these sophisticated tools to both industry professionals and skilled amateurs against a really fair license price. 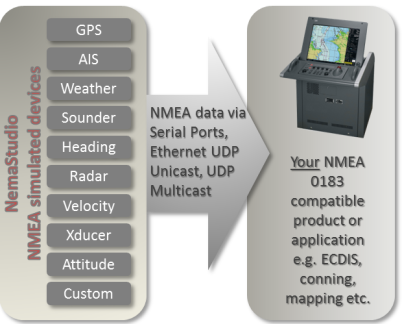 Our products dynamically simulate AIS targets, Radar targets, GPS and many other nautical instruments and generate the appropriate NMEA sentences, both multiplexed or in parallel, over serial and Ethernet ports, ready to feed straight into your application, navigation device or ECDIS. "NemaStudio has a huge value for our SAR organization. The software helps us during investigations related to error and operational handling without the need of connecting all kind of additional and specific equipment. In our world we face a lot of brands and technology on board of our 80 SAR vessels. Originally we started to work with the product in the maintenance and repair department. Currently NemaStudio is used in several areas of our organization like maintenance and repair, research, innovation, simulation, training and assessment. In some cases even at the level of mission critical application. NemaStudio is both technically and financially delivering a significant contribution to our work and primary assignment: Search and Rescue people at Sea. We really like the product and the support of Sailsoft is great. " "Just a note to say we are using your simulator to test applications which we run on our yacht during the Volvo Ocean race. Many thanks for this useful tool." "I am a physical oceanographer, and interested in GPS applications to oceanographic research works. Your GPS Simulator is very useful for my developments of PC-based programs." available for testing different units, as you already mentioned, as radars, satcom, gps, plotter etc.. As well it will be helpful for customer presentation of electronic navigation systems without being on a boat." "I am working with Precision Agriculture that uses GPS signals all the time. This will be a great benefit for me to try to develop more code while in the office where a GPS cannot be hooked up." NMEA and NMEA 2000 are USA registered trademarks of the National Marine Electronics Association. This ultimate NMEA testing tool handles multiple GPS, Radar and AIS simulation sessions in parallel and simultaneously! Sailsoft just released Version 4 of her GPS simulator GpsSimul. The program comes with many new features and a complete new user interface. This is really a great program for those just requiring NMEA 0183 GPS sentences as output. We are continuously adding new functionality to NemaStudio to meet your demands . The latest version of NemaStudio is Version 1.36. New in this version is the optional Bridge Alert Management module, and the possibility to save and reload Settings and Targets. The latter facilitates easy handling of multiple simulation scenarios. Currently we are working on implementing GLONASS and Galileo support in the GPS module, which will after be renamed 'GNSS module'. Suggestions for new functionality? Let us know! Currently NemaStudio has no native support for NMEA 2000. However, by using a suitable third party gateway like the NGW-1 you can easily connect to any N2K network. Will NMEA 0183 be Around Forever? you are invited to subscribe to our free newsletter!